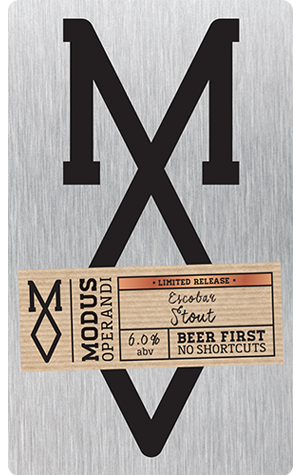 After a couple of years dazzling people with their straight up hoppy IPAs, Modus Operandi has been quietly following a more esoteric path of late. First there was the Earthless-inspired Sonic Prayer IPA, then the Powcohicora-influenced Drupey One, now comes a stout made with yerba mate and named after everyone’s favourite pre-nineties moustachioed purveyor of illicit narcotics, Pablo Escobar. The beer is built on a traditional British oatmeal milk stout base of crystal and chocolate malts, but it veers away from tradition markedly when it crosses the Atlantic and picks up the rest of its ingredients from South America. The first is cocoa nibs, upon which the beer was cold conditioned for two weeks, but the star is the stimulant yerba mate, apparently made from the leaves of a South American tree and which contain the caffeine, theophylline and theobromine commonly found in tea, coffee and chocolate, and which Che Guevara swore by. It’s the tea reference that’s most striking here; upon first sniff and sip you could swear you’re standing over a pot preparing a fresh batch of loose leaf Dilmah. It’s as smooth as a backhanded pay-off with chocolate character and barely any bitterness to note. And yerba mate, we’re told, is low on oil and acid so despite the threat of stimulation you shouldn’t suffer any post-caffeine jitters. Escobar is one of the more unusual local stouts you’ll try, but it’s also unusually enjoyable.